The first tropical storm of the season in the Americas has left at least 90 people dead in Central America amid flash floods and mudslides triggered by heavy rains, officials said Sunday. Tropical Storm Agatha also forced more than 74,000 people to flee their homes as it whipped heavy rains across Guatemala, El Salvador, Honduras and Mexico. "As of the moment, we have reports of 73 people killed throughout the country, the majority from landslides," Guatemala's emergency management agency (Conred) chief David de Leon told AFP. The Prensa Libre newspaper on its website gave an unofficial death toll of 80. Among the dead were four children in a house that was swept away in a landslide, officials said. 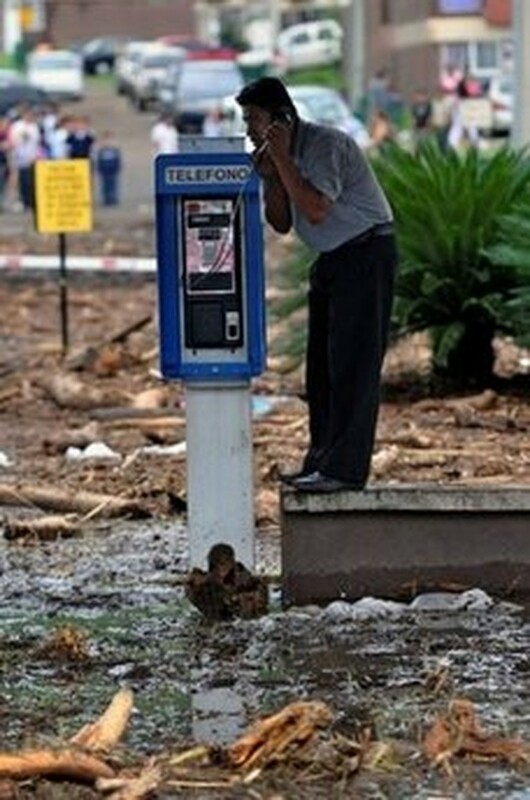 A man talks on the phone on May 30, 2010, in the municipality of Palin, Escuintla, south of Guatemala City. In neighboring El Salvador, floods and landslides accounted for nine deaths, authorities there said. And in Honduras, emergency management officials reported at least eight storm-related deaths as Agatha lashed the country, forcing the government to put five of the territory's 18 departments under a state of emergency. Agatha slammed into Guatemala overnight with 65-kilometer (40-mile) per hour winds and was soon downgraded to a tropical depression as it dissipated over higher ground, but the damage caused by heavy rains and high winds prompted the government in El Salvador to declare a state of emergency. Guatemala had been under a state of emergency since Saturday, while Honduras declared a nationwide state of emergency Sunday and established a crisis management committee to address heavy flooding and other effects from the storm. Guatemalan President Alvaro Colom said flash floods and mudslides forced 74,500 people to flee their homes. He said schools would remain closed until next week. The worst storm-related disaster in Guatemala occurred in a village in Solola department where a landslide swept away 25 homes killing 15 people, with another 10 missing, according to San Antonio Palopo Mayor Andres Cumes. To prevent an outbreak of disease, the bodies will be buried at once, he told reporters. Colombia and the United States offered to send aircraft to ferry aid or help with evacuations of storm-hit areas, and Colom said six US military aircraft were en route from a base in Honduras. Mexican President Felipe Calderon, at Colom's behest, has offered the airport in the border city of Tapachula for emergency flights in and out of Guatemala, Calderon's office said. Guatemala City's La Aurora International Airport has been closed since Friday after being showered by volcanic ash from the eruption of the Pacaya volcano two days earlier. Two people were killed and three missing after the eruption on Wednesday. Vulcanologists at Guatemala's national seismological institute said activity in the volcano was within a normal range, but its director Freddy Sanchez said "it's very possible there could be more violent explosions in the coming days." Colom said that even though the storm had eased, authorities remained on an emergency footing, adding that there were dozens of towns and villages that were still inaccessible because of roads severed by landslides. El Salvador's President Mauricio Funes put his country under a state of emergency, saying that even though the storm was weakening, the risk of mudslides and flash floods "remains very high."